First, congratulations to GothicChessInventor for winning the U.S. Championship in 2000 of Gothic Chess. I'm sure there was a lot of spectacular play in those competitions. The unexpected move I made: 11...Qc8! to make the game ever more complicated. The game was over on move 39 in a time scramble where I delivered checkmate with less than a minute on my clock. Shogi - Meijin is the closest you have to a 'world champion,' currently it's held by Amahiko Sato. Chu shogi - chu shogi has a few organisation in Japan, I don't know about the titles and title holders, if there are any. Thai Makruk/Xiangqi - I don't know much about them to really say, is anyone able to give a rundown? Chess 2: The Sequel - There's no world champions but the one player who regularly plays and retains his 'Grandmaster' title is gbeastlord. I've come pretty close to beating him, though - one game I was Reaper, he was Nemesis, and there was a really long endgame that of course ended up in him midlining. Appears to be a great move (without me being an expert in this particular game). You have an excellent pin on the h3 pawn, and rather than retreating the bishop you defended it with Qc8. The bishop in turn pins White's e2 pawn on his queen, forcing White's d4 pawn to remain isolated. I love this point in games where the board is still crowded and there's lots going on. Well played! Here is an update on some of the star players based on information posted on this thread. I didn't yet add the information from ebinola's post, but plan to do so soon (within a few days). Yes and note after ...Qc8 he can't capture my Bishop with his Archbishop. If AxB? then QxA since, again, the pin is there. He started to reach towards his Archbishop in the game, then froze mid-move. I love when my move has this effect on players That means they didn't even consider my move as an option because they thought it was unplayable. It has been a long time and hard to use the word "current" for this, but Cyber World Championships were held for Grand Chess through the inventor's (Christian Freeling) web site in 1997, 1999 and 2001. No Cyber tournament took place after 2001 to my knowledge. Consequently, I guess I would be still be the current Cyber World Champion (Equivalent to correspondence chess or similar turn based games conducted through a server) for Grand Chess. (10x10 variant). Panzerschiff (John Vehre) Wayne Schmittberger won the first two tournaments. as far as I know there has been no development of engines that could play Gothic Chess at all, since then. There's the new ChessV. Say, what ever happened to Spartacus? True, but I understood it is not WB compatible as an engine yet. Spartacus is sort of in a sorry state. It seems I inadvertently forked the development. (I was not using version control at the time.) So I have two different versions of the executable, one obviously broken for Spartan Chess (it gives +1.80 in the initial position), the other for normal Chess. And there aren't ay source-code files that correspond to their creation date. Spartacus was supposed to be a varaiant-capable engine based on an incrementally updated attack map. At one time I had that working for normal Chess, but then I changed the board size from 32x8 to 24x10 in order to support Grand Chess, and that broke the incremental update, so that I temporarily disabled it. I suppose I could fix that, but in the mean time my ideas for how to incrementally update an attack map have evolved a lot, and even if I could get Spartacus working as designed, I would be quite unhappy with it. I applied my new design for the attack map in my Tenjiku-Shogi engine, and it works like a charm there. So it seems my time would be better spent to completely rewrite Spartacus, based on the same principles. True, the incremental update was hard, and especally hard in the case of Tenjiku Shogi, where you have to deal with jumping generals, Fire-Demon burning, area moves... I did make some allowences there. E.g. the attack map only indicates which victims are in area-move range, and whether the capture is actualy possible is the verified from scratch during move generation. And Demon burns are generated from scratch in every node, assisted by an incremetally updated set of white/black 'bitstrips' (partial bitboards covering 3 files). I am still puzzling on how to incremetally do hook movers, so that the engine could do the larger variants as well. I just started with a routine to generate the attack map from scratch, and compared that map with the incrementally updated one in every node of a perft. But I was surprised how quickly I got it working. Just a few cases of non-terminating loops, because I forgot to increment the index, and such. And throwing out all the stuff specific for Tenjiku would be quite easy. The problem is that the number of Chess-programming projects I have is increasing, and especially the number of 'nearly finished' projects is increasing. 'Inferno' (the Tenjiku engine) has not been released at all, and is waiting for addition of an evaluation term that is crucial in the opening phase. And 'CrazyWa' (my engine for variants with drops on boards up to 11x11) is still waiting for a release of a cleaned-up source code, and addition of some variants of interest (mainly Kyoto Shogi). 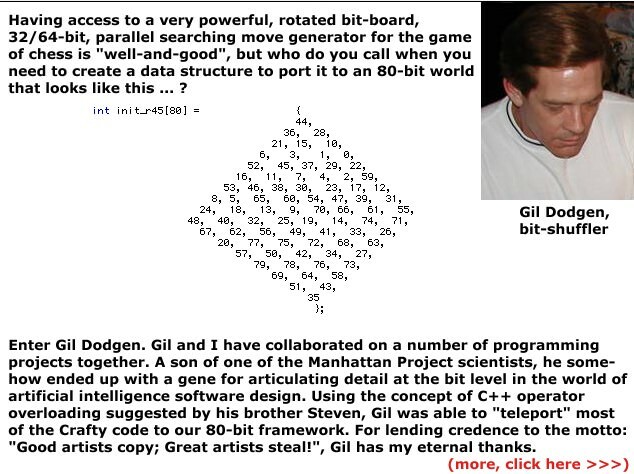 And I just started on writing a Chess program in assembler for the 'Gigatron' retro computer. The oldest = CapaGNU Modified, which was a DOS program that played Capablanca Chess which could be modified to play Gothic Chess. Zillions of Games has a Gothic Chess implementation. Gothic Vortex was the creation of a "Dream Team" of programmers where I was the lead developer. Derived from Robert Hyatt's Crafty 19.something, with programmers Gil Dodgen, Steven Dodgen, Ed Trice, Eugene Nalimov, Marc Bourzutschky, and Andrew Kadatch. TSCP Gothic was a modified version of Tom's Simple Chess Program (by Tom Kerrigan) made by Dutch programmer Michel Langeveld. S.M.I.R.F. ("Strategiespielprogramm Mit Intelligent Rückkoppelnden Funktionen" which is Strategic Game Program With Intelligent Recursing Facilities in German) by Reinhard Scharnagl. There are others that I am forgetting, and H.G. can certainly add the ones from his own "Battle of the Goths" events he hosted. As for "World Champions" of Gothic Chess, or other variants, I am hesitant to use any such title because it really pales in comparison to how the FIDE title is organized. I would say, in the absence of a World Governing Body where the variant is played in live, over-the-board tournaments in multiple countries, with certified tournament directors and a diligently-maintained ratings list, we should avoid such a title. 2001 Larry Kaufmann (I played over-the-board with Larry. He consistently swapped into winning chess positions and killed me). It should be further noted that this is no way implies a "line of succession." In 2000 and 2001, we were still a fledgling variant, and even 1 game with 1 person showcasing dominance is clearly enough to convince me who belongs on the list. My 2 games with Larry Kaufman in 2001 were enough to convince me of that, and watching Michael De La Maza manhandle some players in the earliest version of our online playing site in 2002 led me to believe I would not outlast him in a set match. Both of these players were not active beyond this time, so players coming after had not crossed swords with either of them. John Vehre played a correspondence game with me, and I learned very quickly you can't rely on e4 in Gothic Chess the way you can in 8x8 chess. Fischer was destroying everyone online, giving them 10 minute vs. 1 minute odds and mopping them up. He died 6 months before the match between he and Karpov was slated to take place. In Fischer's absence, Karpov was clearly at the top of the list. It was also the start of a period of Gothic Chess decline, because I owed the match financiers over $800,000. They stipulated that should Fischer not appear and play, for whatever reason, I had to pay them back TWICE the interest that accrued on their portion of the $15,000,000 that was raised for the match. Well, over a 21-month period of time, this interest totalled $400,000, so double that, and that is what I paid back (painfully!) So you can see why I was not interested in playing much for a long, long time. In between that, Susan Polgar played me in 2006, and won in convincing style. She would be awesome in just about any variant I would imagine. In the absence of the Titans, and going over all of the 500+ games I have played, I improved considerably. Without a doubt, I am also at a plateau, and the next strong chess player who comes along could probably knock me off the perch. I recently heard from someone named "Fernando" who said he is the author of Bihasa. He contacted me through the TalkChess Forum. In retrospect, I probably should have thrown a game or two along the way. After blanking their digital offspring a few times, I would no longer hear back from them. I understand their plight. I can't count the number of programs I have started and never finished. Perhaps it was just an interesting distraction for them, knowing full well how hard it would be to create a strong chess engine with so much competition that is out there right now. Anyway, who knows what lies beneath the surface. Another great engine might be lurking out there somewhere. And his engines are quite strong, not at all comparable with simple, minimalistic general-purpose codes like Fairy-Max. Although the state of the art for chess variants is not nearly as advanced as that in orthodox chess. The Stockfish code depends very heavily on the board being 8x8, however. So it is unlikely it will ever be able to do Gothic Chess. What was the format for the Grand Chess Cyber World Championship? Is that a variant chess-engine tournament, or engine-assisted play? The listing that I've produced is intended to show the World Champions for strictly human-play. But engine vs. engine play is interesting and I enjoy reading about it. Not sure if anyone has started a thread specifically for that topic yet. It's awesome to see how engines have improved and see who has developed the best code, particularly for individual games.